Sight words that students need to learn to recognize and read by sight in order to achieve reading fluency. The most commonly used list of sight words, is known as the Dolch Sight Word List, and was created by Edward William Dolch, PhD., and developed basis on his analysis of a selection of children's literature. Dolch subdivided his list of words into "service words" (all parts of speech except nouns) and nouns, and further subdivided the "service words" into 5 progressive levels of difficulty: pre-primer, primer, 1st grade, 2nd grade, and 3rd grade. In general terms, the pre-primer and primer levels are words that children can try (and often do) master while in preschool and kindergarten age groups, and the more advanced levels are usually fully mastered in the first grades of school, but there are always exceptions, and the word is generally useful throughout K-12 education. What can be said for sure is that bingo provides an excellent and fun method for teachers and parents to help children rehearse and master these important words, and thus improve their reading skills. Here are some Dolch Sight Words prepared using our bingo card maker software. Why not download a free trial version of the software, and give it a try? Included in each set are 4 bingo cards, and a call-list. All you need to do is print them out, and you can play immediately. 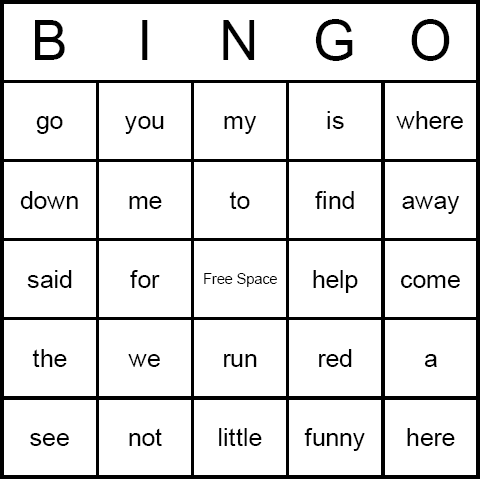 If you want to create your own custom Dolch Sight Words bingo cards (perhaps with more bingo cards, different items, using colors or fonts, etc. ), then why not download Bingo Card Printer? You'll be amazed how easy it is. Note: We haven't included bingo cards with the Dolch nouns on them - but if you download the free trial version of our software, you can easily create bingo cards with these words too!